Even if it doesn’t feel like it, next summer is never very far away. And of course DEICHMANN is always ahead of the crowd in knowing which shoes we’ll be wearing in the coming season. This time it will be comfortable wedges, summery espadrilles, light-as-a-feather sneakers or boho-style sandals. And on cooler days, we’ll be playing it safe with ankle boots in a suede-look or with floral prints. Whether with jeans or a summer dress, you’ll always look the part in this combination. Metallic and glitter appliqués for sneakers and espadrilles will continue to be a big trend. Thick soles are also still very much in and they’re not only comfortable to walk on, but are also upping the style factor. Block heels, elegant stilettos and denim-look models are additional highlights to look forward to. Unusual add-ons like pom-poms or tassels, soft upper materials, prints and jute and woven looks impart an individual touch. A handcrafted look with cork, wood, painted patterns or visible seams is once again referencing the hippie chic look this summer. And this is a style that’s also making itself felt on flat sandals: bright colours, as well as lots of beading and embroidery form the basis of these open, bohemian-style shoes. As the counterpart to the more exciting models, comfortable cork mules have been added to the mix and are being given a feminine touch with high-quality surfaces like patent leather, metallic or crocodile looks and elegant buckles. Adding the glamour factor this summer are mainly large-format flower prints in pastel tones, as well as rhinestone and bead decorations. Delicate sandals are best combined with light, airy summer outfits – for weddings, laid-back garden parties or even a stroll through the city. 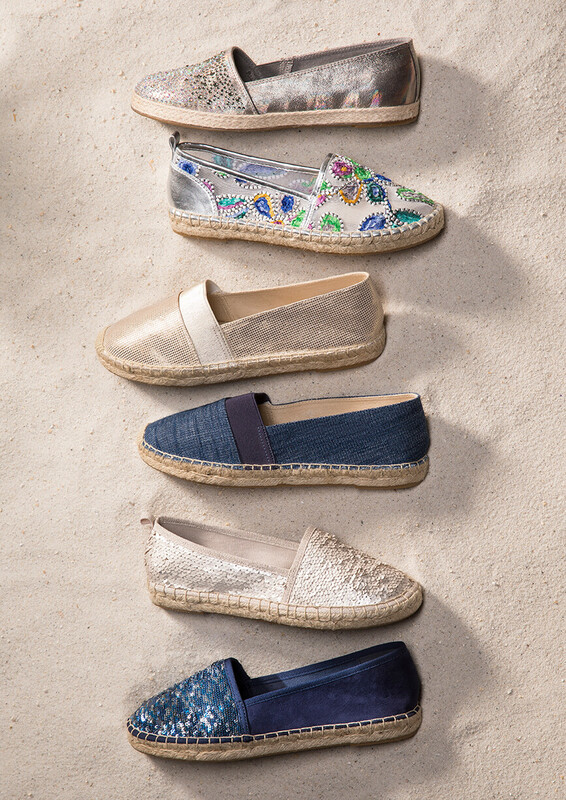 Comfortable espadrilles in soft, natural-coloured tones are the must-have footwear item for city trips. Thanks to the closed design of the shoe, your feet are protected but will remain cool enough in the summer temperatures. Thin nubuck leather makes these slip-ons as light as a feather and therefore comfy companions all day long. If you prefer a more eye-catching look, you can opt for the lace-look styles with floral appliqués, beads or sequins, with models in the trendy metallic look offering the perfect alternative. The sneaker hype is giving rise to the most varied models: in a retro look, futuristic with metallic details or chunky with with kiltie fringing. The classic white sneaker, the icon of minimalism, is being redefined by thick soles and soft shapes. Higher mesh shafts, which envelop the foot like a second skin, offer particular wearing comfort. But the fact that everything now revolves around unusual and exciting sole designs is also being proven by a very special creation: sneakers with LEDs integrated into the soles sparkle in competition with the city lights on long nights out on the town. On cooler days, booties and ankle boots make a welcome change – the designs, mainly in muted earthy tones, are given the perfect finishing touches with floral perforated patterning, cuffs or studs. Patent leather Chelsea boots, in black or white, look great when teamed with loose-fit trousers. Old classics are being reinterpreted this summer: retro styles for sneakers, thick block heels on sandals, loafers and, above all, mules. Thanks to their fashionable colours and small added details, they are set to become a real must-have trend item. With their suede surfaces, slip-ons are becoming a fashionable all-rounder and undergoing a glam makeover with shiny details and summery colours. Italian flair is contributed by simple slip-ons, which in premium-quality smooth leather and an elegant silver buckle, are sure to liven up any outfit. Forgotten classics with 70s charm are experiencing a revival this year. With a rustic block heel or as a minimalist eye-catcher in black and grey tones – high fashion has never been so laid-back. The carefree air of summer is reflected in the light and airy designs of the new, summery scarves. Pastels, understated patterns and lightweight, fine fabrics make these scarves the perfect accessory for balmy summer days. Fringing and small tassels add that certain something, while variations in neon or animal print add the perfecting finishing touch to any plain and simple outfit. Multifunctionality is the buzzword for the bags this summer. Numerous compartments both inside and outside, which can be closed with zips or sleek magnetic fasteners, provide plenty of space, making these latest bag models a reliable companion for every occasion. New and very much on-trend are the denim bags, which, with their extravagant patchwork style, have what it takes to become real all-rounders. Another highlight are used-look shoppers and clutches, which with their roughened surfaces can be combined with either elegant, sporty or minimal outfits. Natural colours or delicate rosé tones, also in a metallic look, are defining the colour palettes of these trendy accessories. A wide selection of boho-style pouch bags boasting brightly coloured tassels, fringing or embroideries, will get all festival fans in the mood for the upcoming summer festival season. But clean designs with solid bases in different sizes, as well as box-shaped clutches with understated adornments like studs and metallic appliqués, are also waiting to be carried on more elegant occasions. Thick white soles are still the highlight of the shoe world: whether robust canvas slip-ons, leather sneakers or classic lace-ups, these soles provide a summery nonchalance to our shoes and ensure a clean, sleek look. Solid trekking sandals support their wearer during all summer activities and are distinguished by their particularly masculine design. Black leather sneakers with white soles and lightweight, sporty models in loud colours with a speckled sole offer wearing comfort with the style factor. Thanks to the elasticated strap inserts, the shoe perfectly adapts to the shape of the foot, guaranteeing optimum stability. Another highlight the men can look forward to is brightly coloured LED soles that will be turning heads left, right and centre. The new models for the business man are sophisticated yet still sleek. Produced using high-quality, ‘made in Italy’ leather, the men will be well-dressed from head to toe this season. The elegant men’s shoes are standing out from the crowd with out-of-the-ordinary surface designs: light perforations, roughened, retro-style leather or crocodile-look surfaces. And as far as colour is concerned, black is still the new black. 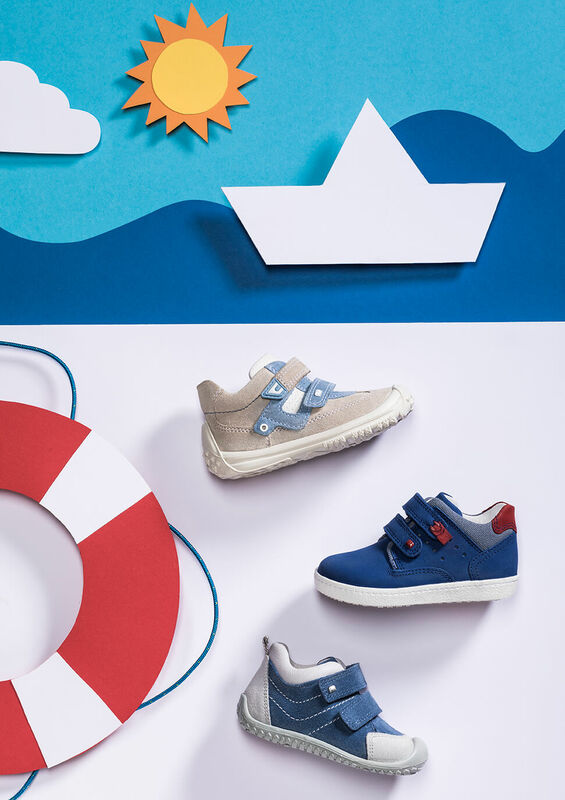 The most important colour themes of the children’s shoes for the spring/summer 2017 season are reminiscent of a seaside sweet shop. 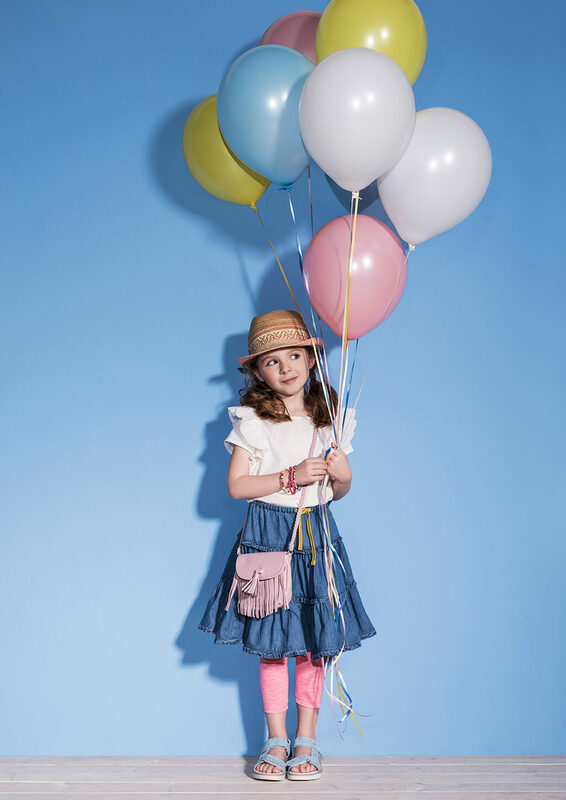 Girls can look forward to a choice of delicate marshmallow hues like rosé, lilac, turquoise and mint. Meanwhile the boys will have their pick of ocean-themed hues: azure, aqua, turquoise and pigeon blue. And they will both be combining these looks with white and light grey, especially when it comes to the soles. The trend for material mixes of smooth leather, suede and nubuck or leather looks – combined with prints and patches – is set to continue. Playful millefleur prints, heart and flower appliqués and metallic elements are also making an appearance in the girl’s collection. And lettering is jazzing up the boys’ models. This coming season they will both be loving sneakers – from low-cut to high-top, equipped with handy Velcro straps – as well as robust sandals with sturdy soles. And for little ladies, ballerinas with and without an instep strap are also a must-have footwear choice. DEICHMANN SE, which has its headquarters in Essen, Germany, was founded in 1913 and is still 100% owned by the founding family. The company is a market leader in the European retail shoe trade and employs over 37,300 people worldwide. Branches are operated under the name of DEICHMANN in Germany, Austria, Bosnia-Herzegovina, Bulgaria, Croatia, the Czech Republic, Denmark, Hungary, Italy, Lithuania, Poland, Portugal, Rumania, Russia, Serbia, Slovakia, Slovenia, Spain, Sweden, Turkey and the United Kingdom. In addition, the Group is represented in Switzerland (Dosenbach/Ochsner/Ochsner Sport), the Netherlands (vanHaren), and the USA (Rack Room Shoes/Off Broadway). In Germany, Roland SE is also part of the corporate group. The company is represented in Germany, Austria and Switzerland with MyShoes SE.